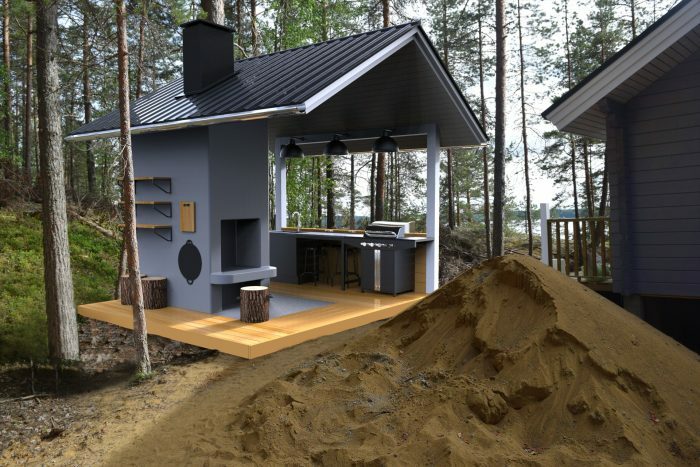 For her personal project, Tilda Jyräsalo decided to design a summer kitchen for her boyfriend’s parents’ newly built cottage located in Eastern Finland. 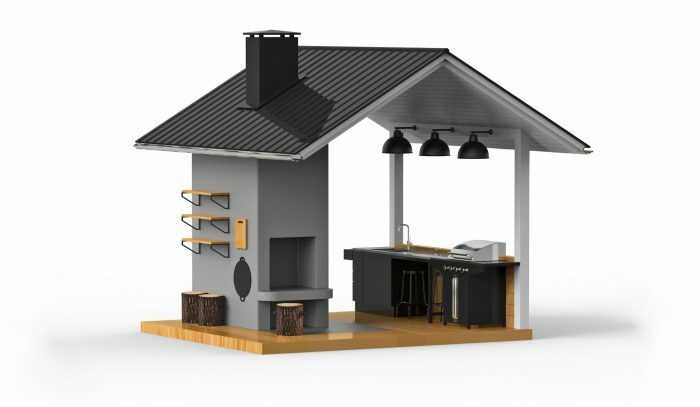 At the moment it is still a concept, but very soon it will be a real place to cook and socialize in. 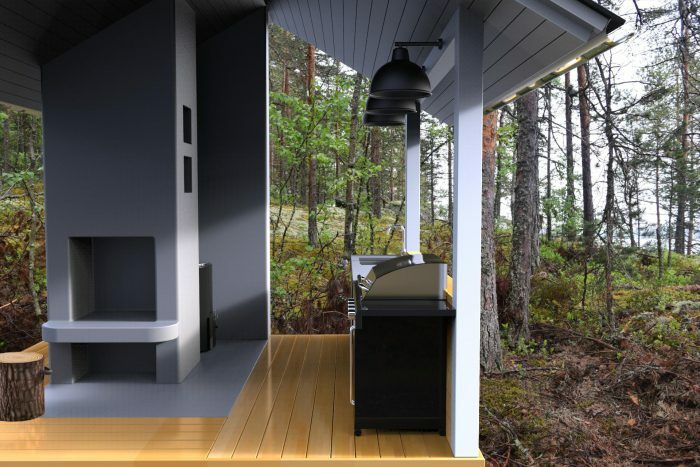 For my personal project, I designed a summer kitchen for my boyfriend’s parents’ newly built cottage located in Eastern Finland. Functionality was strongly emphasised and the unique nature wanted to be appreciated. Main needs for the summer kitchen were preparing food and dishwashing so extra attention was paid to designing a kitchen to serve these tasks. The layout was designed so that the dishwasher has a beautiful view to the lake. Also, a person shouldn’t feel isolated when doing the dishes, on the contrary, the kitchen should welcome people to spend time there, not only perform tasks. The space should invite people to have a morning coffee when others are still sleeping and to gather together in the evening. Some other requirements were to have enough working surface, storage and a waste sorting system. Biggest design decisions probably concerned the location and the layout that I was working a lot with. The kitchen is located close to the cottage and a fridge and storage indoor as well as to the front deck where most of the dining will happen. In addition, slightly behind the cottage it’s seemingly less windy. In the end, we decided to have one working line and a fireplace instead of two working lines facing each other. One working line is simple and all of the essentials are handy within reach. It’s a space efficient solution as the main working surface is placed between the sinks and the gas grill. One working line also enables having a cosy outdoor fireplace to gather around. 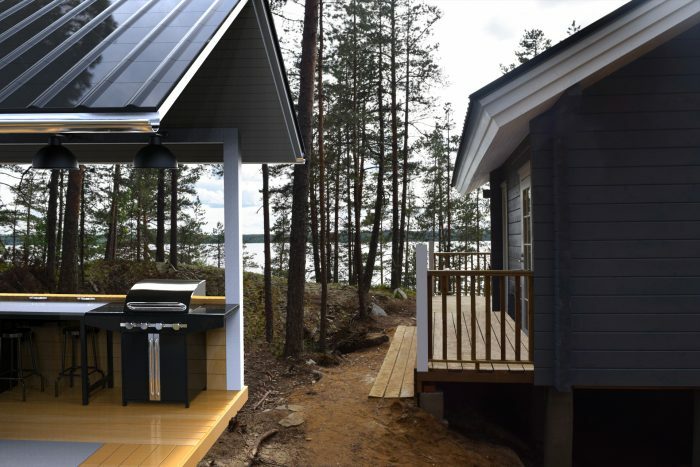 One obvious requirement was that the outdoor kitchen should tolerate weather conditions in Finland. This has been considered when deciding the materials. Every permanently placed object that is not going to be moved indoor for winter time should deal with snow and cold. 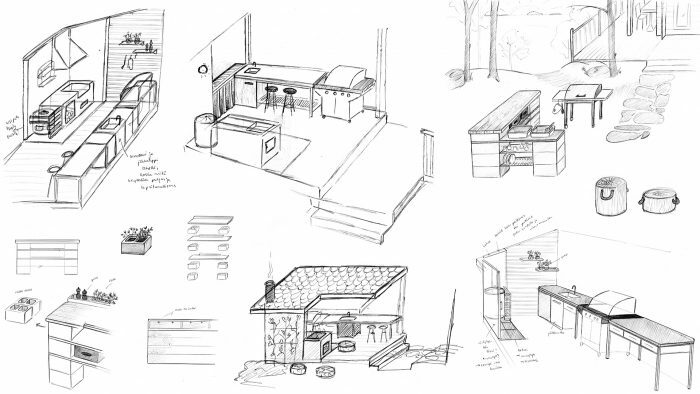 The discussion of the relationship with nature was truly interesting as the summer kitchen was wanted to be an open and light outdoor space that would communicate with its surrounding nature – the space shouldn’t end where the borders of the kitchen end. On the other hand, it was wanted to be protected from that same nature when it’s raining or storming. We will see if any additional protection against wind or rain is needed. But basically, there is a place for that between the horizontal pillar and the countertop. Nature was a design-driver that provided inspiration for the layout, materials and colours. 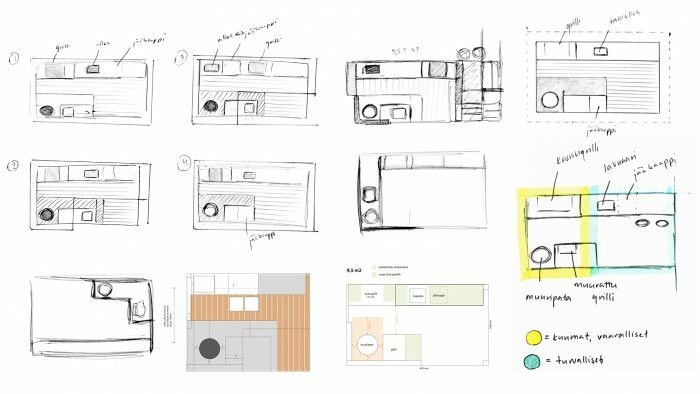 Decisions concerning visuals were based on the nature and the aim to fit the style of the cottage. Coherence was targeted and shows in the angle and materials of the roof, white pillars and deck material similar to the cottage, just to name a few. My personal project included continuous benchmarking and ideation along the year. Sketchbook and ballpoint pen were my dearest tools. On the summer, I was able to have two on-site visits where the ideas were refined and validated on the actual context. By the end of the project, the ideas continued to find their forms and measurements in 3D modelling. I learned that designing a kitchen includes lots of details that need to be carefully considered. I sometimes found setting the boundaries to be challenging as I was adding features and functions and constantly combatting with the amount of space. In the end, it was essential to remember what are the needed main functions and concentrate on creating the best experiences around them.